The Oramics Of Pre-Who | Warped Factor - Words in the Key of Geek. Chris Morley pays tribute to the electronic music pioneer Daphne Oram. Delia Derbyshire is often credited as the woman behind the success of Doctor Who in a Radiophonic context. 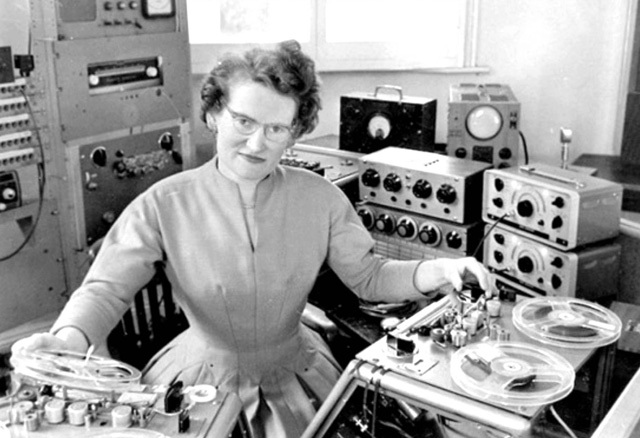 But surely the true mother hen was Daphne Oram, who laid the sonic groundwork? Turning down an offer to study at the Royal College of Music, she instead joined the BBC as a studio engineer & music balancer in 1942. It was during this time that she began experimenting with tape recorders, which in the early Fifties led to a campaign for the BBC to provide the necessary facilities for producing electronic music/effects for radio. By 1958 the Beeb indulged her, paving the way for the creation of the Radiophonic Workshop - which would of course have a large part to play in the development of a certain new science fiction series by late '63! Just a year after assuming the post of studio manager, though, she was gone, feeling perhaps that she'd gone as far as she could with the burgeoning cult sound laboratory & wanting to develop her own technique on her own terms. To that end she was awarded a grant to the tune of what was then £3550, equivalent in today's money to around £68000, to work on her own Oramics system. "She lived music. She was as poor as a church mouse, because any money that came to her went into her music gadgets . To me she was a kindly rather eccentric aunt. 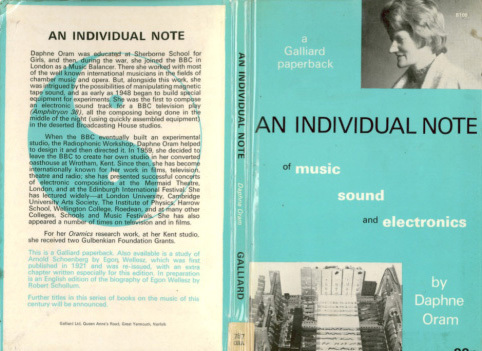 But she had a very clear vision of how the computer would revolutionise electronic music." "A large rectangular metal framework provides a table-like surface at which the composer works. Ten synchronous parallel strips of clear film (sprocketed 35mm stock) are divided into two groups of five; each strip serves for the notation of a single parameter. 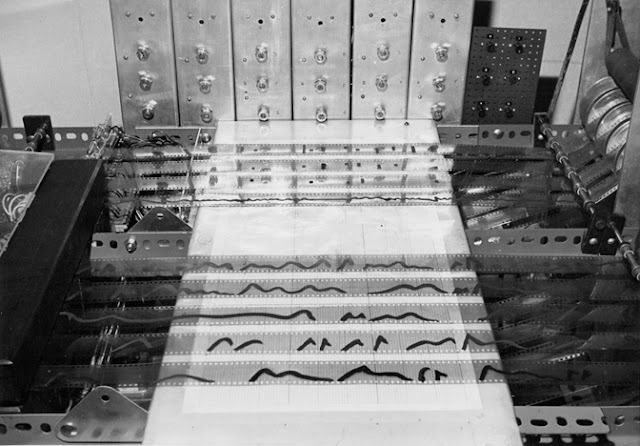 The composer draws on these with erasable ink or sticks cutout of black adhesive tape onto them, forming masks which affect the amount of light that is received from a bulb mounted above each strip by a photocell below (on the left side of the machine), thus modulating the photocell's output. For orientation purposes a calibrated board (normally 10 cm per second) can be placed below the strips. Pitch is notated digitally on the three strips at the rear with neume-like symbols, covering a range (including transposition) of seven octaves; two of these produce a series of basic frequencies set a fifth apart, and the third one provides any of the intervening semitone intervals; microtonal tuning is also possible. The remaining two rear strips operate switches for other devices, one internally and the other externally. The front group consists of strips on which analogue drawings control envelope, dynamics, vibrato, reverberation and timbre mixes." It took dedication, & she proved herself a keen student while working at the Beeb. "After Oram had finished her day's work, and everyone had gone home, she trundled tape recorders the size of industrial gas cookers from empty studios, and gathered them to experiment late into the night. She recorded sounds on to tape, and then cut, spliced and looped them; slowed them down, sped them up, played them backwards. It must have been like working in a laboratory, or inventing new colours – a new world almost impossible to imagine now." Yet her innovations would allow those viewers settling down to watch that pivotal first episode of Doctor Who to imagine the soundscapes of many strange new worlds. DOCTOR: You're not as doubtful as your friend, I hope? BARBARA: I can't help it. I just believe them, that's all. DOCTOR: If you could touch the alien sand and hear the cries of strange birds and watch them wheel in another sky, would that satisfy you? While we've yet to hear those alien birds' cries, the carrot of their possibility in the first place is perhaps the best advert for the quality of work put in by those early denizens of the Workshop as so passionately fought for by Oram. The engineer who helped make her machine a reality, Graham Wrench, would later tell Sound On Sound of the enormous toll the project took on her health. "Daphne was taken suddenly ill — she was found by her housekeeper, collapsed on the floor of her studio. Some BBC friends rushed her off to a private clinic; they thought at first she'd had a brain haemorrhage, but it was never made clear what it really was. She was such an intense person; I personally thought it was exhaustion — some sort of a breakdown. I also worried that it could have been the Oramics machine that had caused it. It could produce subsonic frequencies — down to about 5Hz — and it was all too easy to leave it switched on and not realise. Around that time there used to be a man who gave lectures on sound; his trick to end the show was to play a low sound at the resonant frequency of the human bladder. You can imagine — the room emptied in minutes! Well, I worried that Daphne could have been affected by low frequencies, because she'd often stay up all night, working in the studio." It even warranted a Science Museum exhibition, with a campaign to republish her long out of print book An Individual Note also a resounding success. So she wrote in its introduction, the department she left behind allowed to get on with continuing her work every Saturday teatime from '63 to 1989 in various permutations - rendering her worthy of tribute here!